With experience that spans more than a decade, Skip Edwards has certainly earned the title as a grinding and polishing expert. In 2011 and 2012, Skip was recognized at the World of Concrete with the prestigious first place award for the Best of Class Propane during the Concrete Rodeo. Skip can teach you the latest in decorative polishing techniques that will give you the tools you need to stay ahead of your competition and make more money. You can learn more about him at www.skipedwardstraining.com. What deters many contractors from polishing wet is the mess they have to clean up. However with GelMaxx products, the hassle of dealing with slurry waste water is eliminated. Skip Edwards will be demonstrating how to get an amazing polish with Gelmaxx in half the time as the traditional dry polish. The cost of the training will be $150.00, which can be applied as credit toward GelMaxx product purchases. 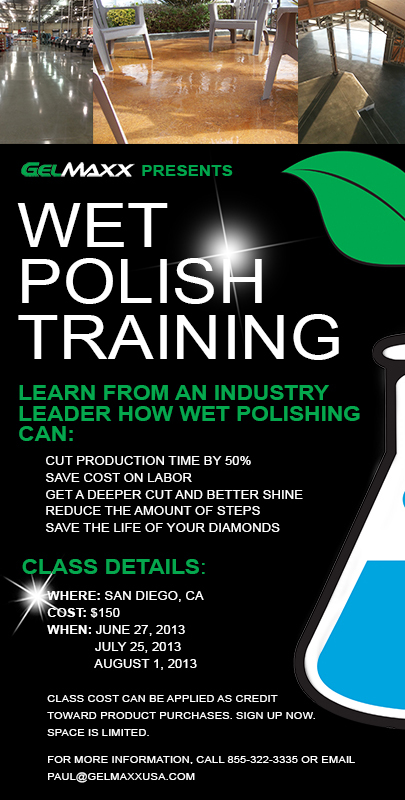 The class will be in San Diego, CA. After your polishing training session, make sure to enjoy all that beautiful San Diego has to offer. There are world renowned beaches, the famous San Diego Zoo, Sea World, and many more attractions. For more information or to sign up, please call 855-322-3335 or email paul@gelmaxxusa.com. Make sure to sign up now. Space is limited.